Increased enrollment has created space issues at our school. Sadly, our Daycare partners will be giving up one of the Daycare rooms to accommodate the school’s growing needs. While we continue to work with our Daycare to ensure the changes are seamless, we also recognize and appreciate that Unicorn Daycare will continue to offer Before and After care services to our students including their hot lunch service. Many rooms in our school are permitted by Daycare throughout the day. The Primary and Junior school yards are permitted by Daycare starting at 3:30 p.m. each day. To support our growing needs, our Safe and Caring Schools Committee comprised of teachers, parents and administration have examined our school hours. 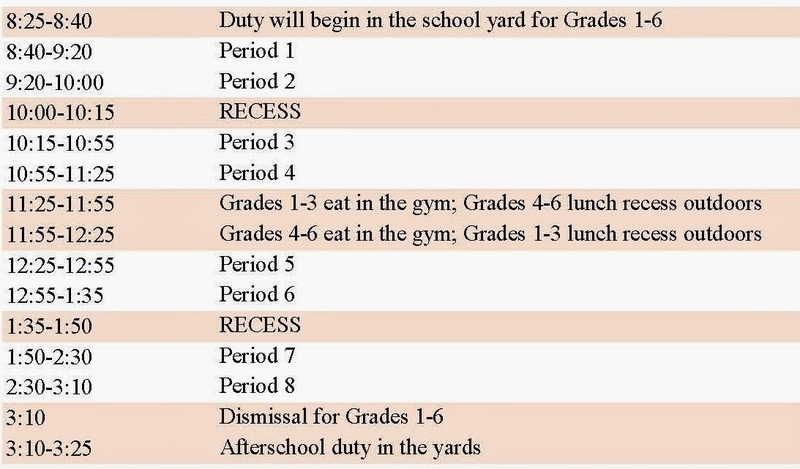 The following entry and dismissal changes will be made for the 2014-2015 school year. The Kindergarten hours will be announced in June once all registrations have been confirmed and we have our final numbers for September 2014. We will be aligning the hours as close as possible to the Grade 1-6 hours to accommodate our parents with Kindergarten, primary and junior siblings. Our enrollment numbers for 2014-1015 have increased. Over the next few months, our office will be calling parents to re-verify address information and asked to bring in proof of address information once again. Brown P.S is a “closed” school. We are only accepting students that live within our boundaries (catchment area) for English and French currently. Families that move out of district must attend the home school that corresponds to their home address. Parents that recently pre-registered their children at Brown are awaiting acceptance from our office after address verifications have been completed. Addresses will be checked again during the 2014-2015 year. This will be a best practice at Brown P.S as our numbers continue to increase. We appreciate your patience and understanding during this process as we ensure only students within our catchment area may attend Brown P.S. We have not received the names of the students who have been accepted into our Early French Immersion Senior Kindergarten Program yet. Our office will contact parents for a registration appointment once the names have been received and confirmed. Parents new to our Brown P.S community are invited to our Kindergarten tour on June 17. There will be a 9:30 a.m. session and a 1:30 p.m. session. Parents will be contacted by our office to RSVP. There are several students at our school who suffer from life-threatening allergies to nuts, this includes sesame seeds. Prevention is the best approach. Therefore, we ask your co-operation in not sending any snacks or lunches containing peanuts, nut products or foods that may have been cross contaminated with nuts with your child. Students who have severe allergies to such food substances are exposed to a severe health risk when nut products are consumed in their environment or shared with them. Please speak with your child about not sharing their snacks or lunches with other students. The Board has procedures for the prevention and management of anaphylactic reactions. If you are interested, contact me, the Principal for further information. Further information is also available through Anaphylaxis Canada (416-785-5666). If your child has health problems of any kind that have not been reported yet, please inform your child’s teacher or office staff immediately so that the necessary health protection steps may be taken. Your understanding and co-operation in ensuring the safest environment for all our students and staff is appreciated. Permission Forms and Itinerary with payment information were distributed to Grade 6 students. Permission forms are due on March 6, 2014. Parents are asked to follow the payment schedule as requested by the excursion operator. We promote 100% participation for this Grad trip for educational purposes and for the great relationship building and memories these excursions are known for. Parents that would like to discuss this opportunity are asked to kindly call Principal Christakis. Our World Changers organized a wonderful WE ARE LOVE campaign in February to raise money for Free The Children. These LOVE pins/buttons were distributed on Valentine’s Day and we thank all of our students and parents for helping raise funds and most importantly, awareness. In this day and age, it is important for all of us to help families around the world to have safe sources of drinking water and shelter to live in. We are also helping build schools to allow all children to have access to education around the world. Great thanks to Mme Breslin, staff, students and parents for their tireless efforts in organizing the campaign and volunteering their time for this great cause. The Scholastic Book Fair is scheduled for May. We will be sending information about the Book Fair in April’s Brown Bulletin. There will be French books available also. Thanks to Mme Gagnon for organizing this annual book fair at Brown P.S. Beneath Springhill: The Maurice Ruddick Story came to Brown P.S. on February 18. This moving story about the Mining Disaster in 1958 was retold to our Grade 4-6 students with an entertaining and educational musical twist. Ms. Holland and our students presented at our African Heritage Assembly on February 25. Students learned about prominent black leaders and their contributions to the world regarding fighting for freedom and justice for all. Students also entertained us with their dance and musical talents as they took us through the history of music and prominent black entertainers of yesterday and today. We thank Ms. Holland, Ms. Turner and our students for this assembly. Our students participate in monthly assemblies to learn about the TDSB Character Attributes. What does honesty look like/sound like? We continue to develop character in all students and this is a shared responsibility between home and school. There is a need for family, community and schools to engage cooperatively to encourage students' learning and maturing as social beings. Throughout the year, we continue to focus on the 10 attributes identified at the TDSB and we encourage parents to reinforce these attributes at home whenever possible: Respect, Responsibility, Empathy, Kindness and Caring, Teamwork, Fairness, Honesty, Co-operation, Integrity and Perseverance. On behalf of our staff, we would like to wish everyone a Healthy and Happy March Break. Daylight saving time starts on Sunday March 9 at 2:00 a.m.